Despite the horrible stormy weather during the days leading up to RLSS Poole Lifeguard’s annual Brownsea Island Swim, on the morning of the swim the sun was out, the wind was calm and 300 swimmers turned out to take part in the 6.5km swim around Brownsea Island. This has become one of the most iconic swims on the open water swim calendar, with all 300 places being snapped up within 15 minutes of the entry forms going live back in February and the entry forms being taken off line 10 minutes later due to another 150 swimmers on the reserve list. The motto behind the swim, which has been held since 1991, is Held in the Spirit of Self Belief and Madcap Adventure started by the few who wondered if they could “Swim Around Brownsea Island” – Not so much a race but a voyage of discovery! The strong winds and fast tides at various stages around the island make for some very challenging conditions for the swimmers to endure, so a very apt motto indeed!! 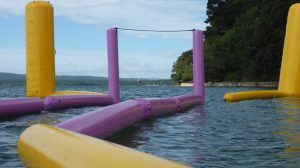 In 2009, RLSS Poole Lifeguard decided to encourage swimmers to use the Brownsea Island Swim to raise sponsorship for charities of their own choice. The total amount of money generated by swimmers this year now stands at a massive £27,764.29 all of which goes towards a large number of local, national and international charities. (see the table below for the list of 2017 beneficiaries). This brings the total sum raised by the swim since 2009 to a whopping £151,955.21 which is something that RLSS Poole Lifeguard and all our supporters that help on the day, should feel extremely proud of. A full set of results can be found on the lifeguards website www.rlss-poole.org.uk/brownsea. Here are the top 3 places in each category. We are extremely fortunate to be able to have such a picturesque island to swim round and for that we are extremely grateful to the National Trust Brownsea Island for their continued support and involvement. The swim starts and finishes on the private beach, within the grounds of the wonderful Brownsea Castle, for which we also extend a huge thanks to the John Lewis Partnership who also supply a a very welcome cup of home made soup and bread roll for all the swimmers once they have finished their swim. To enable this unique open water swim to take place, RLSS Poole Lifeguard, who are a small club of volunteer lifeguards, call upon a whole host of neighbouring lifeguard and lifesaving clubs as well as other clubs / organisations to help with the safety cover and for the marshals for the event. In total we had 60 paddle craft, 15 safety boats and 40 marshals. All of whose give up their time for free to enable this swim to take place. A list of clubs and organisations that assist with the running of the event are listed below. South Worcester Life Saving Club; Southbourne Surf Life Saving Club; RLSS Boscombe Lifegaurds; Bournemouth Lifeguard Corps; Branksome Surf Life Saving Club; RLSS Poole Lifeguard; Poole Harbour Canoe Club; New Forest Kayak Canoe Club; Maritime Volunteer Service -(MVS) Poole; East Dorset Open Water Swimming Club; plus a number of friends and associates who do not belong to any club/organisation. All in all, another fantastic year, so thank you to all who helped make this swim happen and also a thank you to all the swimmers who took part this year, we hope you all had a great day with us!